Compass point is a great place to rent a room for a romantic getaway, enjoy a meal and or drink at its open air restaurant and bar, or inside at its intimate music bar. It is open early 8am for breakfast until 11am, lunch until 5pm and dinner until 10pm (Sunday - Thursday ) and 11pm ( Friday and Saturday ) a short bar menu, including pizza's is offered extending three additional hours every evening. The point has live music beginning at 10:00pm Tuesday, Thursday, 10:30pm on Saturday and Sunday afternoons for 3 hours between the hours of 3pm and 9pm. The restaurant has recently had its menu changed to include a selection of fresh fish, conch, crawfish (lobster) and grouper, Bahamian favorites stew fish, boil fish and conch salad, and a expanded selection of wines and cocktails. Click HERE for Barefoot Retreat and Spa at Compass Point. 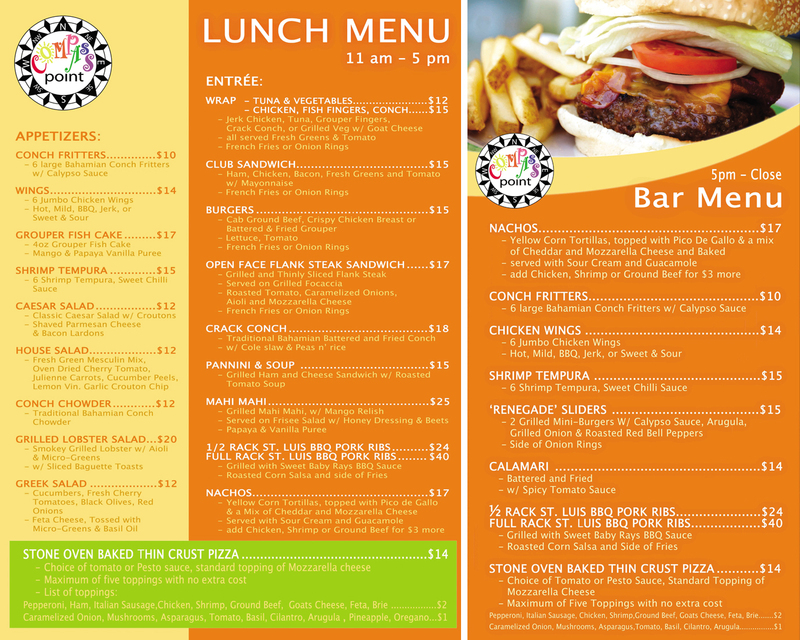 Restaurant Come In And Try What's On Our New Lunch Menu and Bar Menu! 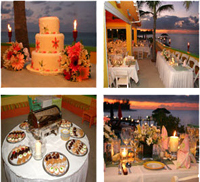 Dreaming of a destination wedding in Paradise? Let Compass Point host your very special day. We can create an experience that you will remember and treasure forever. From the rehearsal dinner to the wedding day, we can accommodate up to 100 guests. Had an incident where my date and I went there a bit late. Unfortunately, just as the kitchen closed and had a problem that after we ordered we couldn't get our dinner! Manager came out and offered bar menu and complimentary drinks. However just as we assumed we were done! Valaaaaa!!!!!! Here came our order by surprise and courtesy of the chef!!! We were beyond astounded and must I say the chef had placed here entire heart in that meal for it was scrumptious. NOW THAT IS WHAT I CALL SUPREME CUSTOMER SERVICE!!!! WAY TO GO COMPASS POINT!!! GREAT FOOD GREAT SERVICE AND AN EXCELLENT CHOICE!! Compass Point is kinda out there but the food is definitely worth it. Went for lunch there yesterday and had the Thin Crust Pizza- 5 toppings for just $14. It was incredible. The ingredients were fresh, and the pizza truly tasted gourmet. For the toppings I reccomend ham, italian sausage, carmelized onions, mushrooms, and feta cheese. DELICIOSO!!! I went their for lunch yesterday and had the soup and sandwich. The soup was home made and delicious the cheese and ham sandwich was also very good.